The first thing you’ll notice here is the abundance of Chinese Communist propaganda books on display, followed by the opening and slamming of doors from the private dining room, revealing a cloud of smoke wafting from the mouths of Chinese officials meeting inside. Evidently we’ve come to the right place. Old Beijing used to live a few floors above and has since found a new floor and some extra cash for a light renovation. But despite the new digs, the menu remains the same: classic northern Chinese cooking. And the reason this is a favourite among expat Beijingers is that the traditions of the kitchen have remained true to the Red Capital. 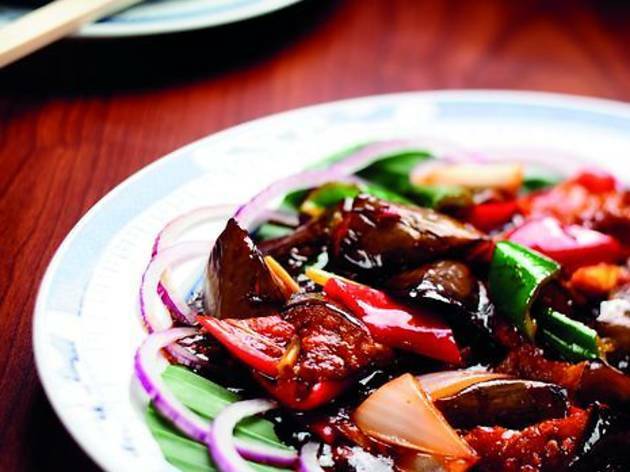 Greasy plates of spicy fried eggplant with minced meat ($50) are a staple at every table. The diagonal-cut eggplant absorbs much of the cooking oil and chillis, and the meat itself remains intact without crumbling into a mushy pulp like at many old restaurants. This coupled with a bowl of white rice is a dream. Next up came a plate of boiled pork and fennel dumplings ($55). There was nothing ceremonious about these, but the canny use of fennel was the key to its success, with the fennel fern in the dumpling being strong and the skin thick. However, only order these if you truly enjoy its flavour as it is something of an acquired taste. Now, a quick word on the menu itself: written in Chinglish, the English translation gets you close, to what you are eating, but can read rather odd. Here we have “pork meat with brown sauce” ($78). This is actually moo shu pork with flour pancake. 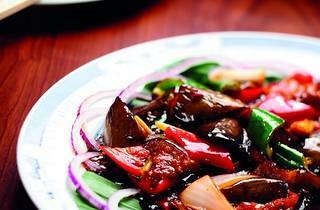 The gloss of the “brown sauce” (oyster sauce, soy sauce and vinegar) gave the otherwise bland strips of pork meaning. The pancakes should be eaten steaming hot along with the bed of julienned scallions that the meat sits on. The “squirrel-shaped mandarin fish” ($280) is a classic dish from the north. It gets its name from the way the chef diamond cuts the flesh of the fish, so when it is deep fried the fish tail curls (sort of) like that of a squirrel. It was served with a vinegar based sweet and sour sauce. Though the sauce was well-balanced it wasn’t enough to make this dish a winner, as the fish itself was disappointing. One senses it had been plucked from the freezer just prior to service. Simply put, the meat was dry and without bounce. If only they could serve something fresh from the market this would be a hit, as the double-frying technique and the sauce was spot on – as was pretty much everything else they offer. 50 Jardine St, Causeway Bay, 2203 4321. Daily noon-10pm. Meal for two: $400.